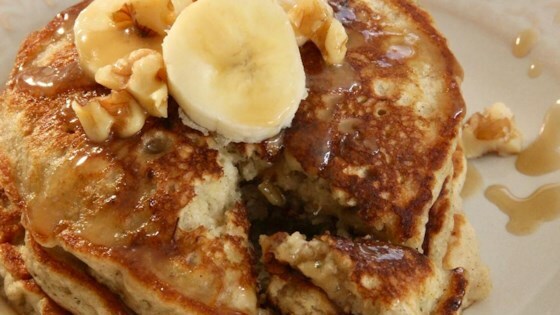 "This has to be one of the best pancakes I have ever had. They smell wonderful and taste like banana nut bread! When you make these on a Sunday morning, they disappear before you know it." Mix flour, walnuts, sugar, baking powder, nutmeg, cinnamon, baking soda, and salt in a large bowl; make a well in the center. Whisk almond milk, bananas, melted butter, and vanilla extract together in a separate bowl until smooth. Whisk in egg. Pour mixture into the well in the flour mixture; stir until just combined. Heat a lightly oiled skillet over medium-high heat. Drop 1/4 cup batter into the skillet; tilt gently to spread batter evenly. Cook until bubbles form and the edges are firm, 3 to 4 minutes. Flip and cook until browned on the other side, 1 to 2 minutes more. Repeat with remaining batter. Delicious! It makes six 5 inch pancakes, two servings for us because they taste so good! Amazing! The only changes I did were brown sugar instead of white sugar and didn’t use nutmeg. Used 1/3 cup batter per pancake. Heated up the skillet to medium and each pancake was great!